Turns out the Huracan performante isn't the only Lambo that likes to snag records. 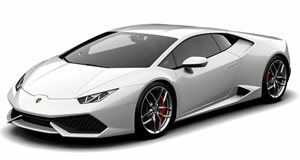 To its credit, the Huracan has launch control like any other Lamborghini, but aside from that the only helpers are the fact that it has all-wheel drive and a 5.2-liter V10 engine cranking out 602 horsepower. Luckily conditions were almost optimal for the 10.39 second time predicted by Brooks Weisblat, the one and only Drag Times guy. Even with little time to prep for the run, the result was a new record quarter mile run of 10.44 seconds, not a record officiated by Guinness but proven through drag strip receipts. Chalk it up as another win for Lamborghini, which has been busy proving that its medley of Italian and German engineering is working out just fine.